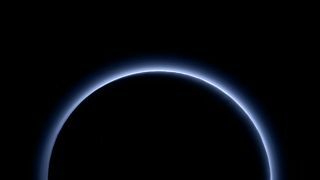 NASA has released new images taken by the New Horizons probe of Pluto's atmospheric hazes, revealing that the dwarf planet has a fuzzy blue sky. "Who would have expected a blue sky in the Kuiper Belt? It's gorgeous," said NASA's New Horizons principal investigator Alan Stern. NASA explained that a blue sky is usually caused by the scattering of sunlight by very small particles, but while one might seem familiar to us on Earth, the particles in the atmosphere that make up Pluto's blue haze are different. "On Earth, those particles are very tiny nitrogen molecules," NASA researcher Carly Howett explained. "On Pluto they appear to be larger - but still relatively small - soot-like particles we call tholins." And unlike on Earth, you won't actually be able to see the blue sky at all times on Pluto, instead seeing a black sky most of the time due to the planet's atmosphere. Speaking to the BBC, NASA's Howett said, "The haze is pretty thin, so you'd mostly see the color of the haze as blue sunrises and sunsets."